“Physical exertion” and “fun” may not be words that a lot of people would put together, but we’ve already seen examples looking to making exercise more enjoyable for those that aren’t naturally drawn to it. Icaros is a ‘bodytainment’ system that uses VR to let users fly while they exercise. Another example would be Step Ahead: Zombies, a story-themed walking challenge that uses wearables to encourage workers to escape an in-game zombie invasion through real world activity. Now, using wearable technology and 3D printing, Edipulse from Exertion Games Lab is printing chocolate according to how much the user worked out. To begin, users put on a wristband heart monitor. Their heart rate is then tracked throughout the day, and as they exercise, this data will be sent to a 3D printer. 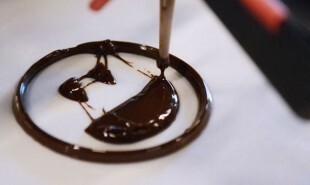 Each evening, chocolate will print from the 3D printer according to this data. The form of the chocolate is determined by the amount of exercise — the more they work out, the more beautiful and cheerful the chocolate will be. It will even print a sad face if their exercise that day was lacking, and produce encouraging messages if the user reaches their goals. While Exertion Games Lab acknowledges that it may be less counterproductive to print a healthier reward, the present state of 3D printed food is relatively limited. Can 3D printing be used in other ways to positively reinforce physical activity?